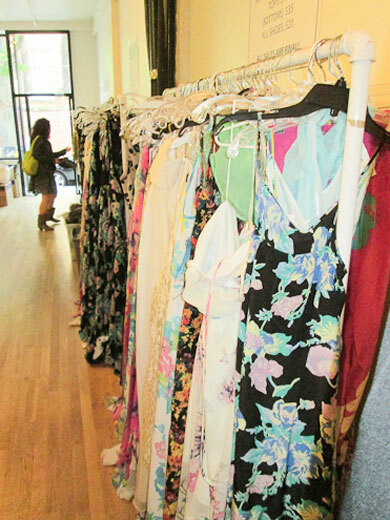 One thing about sample sale shopping that can be a challenge is the lack of on season selection. Sometimes when you reach a sale, they are liquidating sweaters and jackets when it is 75 degrees outside. The disconnect is sometimes enough to stop a purchase, thinking about the large stash in your closet. Then sometimes you stumble upon a sale filled with all of the things that you want to wear immediately, and those can be the most dangerous. Tucked away in between SoHo and the Lower East Side on Prince street is a little storefront full of promise. The Yumi Kim crew decided to drop back-stock on us, and it is glorious. Not a far walk from the regular shopping mecca on Broadway and Lafayette Street on 40 Prince Street, you can find the princess romper you may have skipped over last year. Prices were pretty great, at $55 for a dress or romper, $40 for a top and $20 for shoes. There were racks filled to the absolute gills with countless options. No lines, no waiting, and a clear shot to the dressing room makes this sale a hidden gem, not on everyone’s radar by any means. Yumi kim is known for their hyper feminine florals, beading, and cut styles. You can go backless, long sleeve, cutout, and short or long and find both your size and the exact cut you are looking for. This is rare, and one of the reasons why this is a must stop if you are lacking in girly glamour pieces for this spring and summer. Shoes were at the deepest discount, with most going for $20. 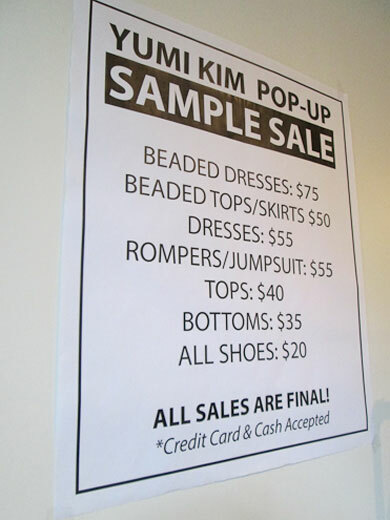 Yumi Kim doesn’t manufacture shoes, but carries brands such as Jeffrey Campell, Dolce Vita, and Minnetonka. So brand you are used to seeing at Urban are going for $20 in many different sizes. This alone makes the visit worth it. Folding flats, snakeskin sandals, fringe galore and cork platforms could all be found and all for $20. Accessories such as jewelry and belts were also available at a very deep discount. 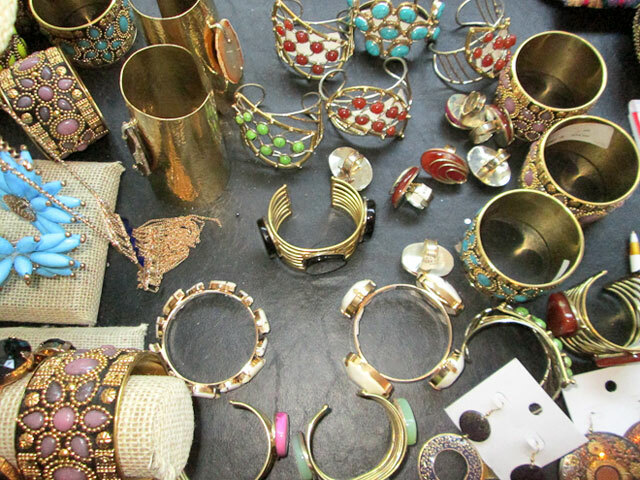 Bold brass bangles were $10, in many different styles. There were lacquer rings for $10 and less, which could up your accessory game with not much effort, so stock up on those. Belts in a huge box near the shoe display were also $10 or less, so again stock up on these cheapies, they aren’t anywhere near that affordable on the regular. This isn’t the largest space, but this weekend should be a crazy shopping weekend, so I were you I would hit the sale before friday for some Mem Day classics. The sale itself is lasting until Monday, so you have a bit of time to swing by, though we don’t recommend waiting too long!